The giant saguaro cactus (Cereus giganteus) is indigenous to Arizona; it grows to a height of forty to fifty feet and lives to an age of 150 to 200 years. Native to the Sonoran Desert in the southwestern United States and northern Mexico, saguaros (pronounced "sah-wah-roh") are slow-growing and take up to 75 years to develop a side shoot. 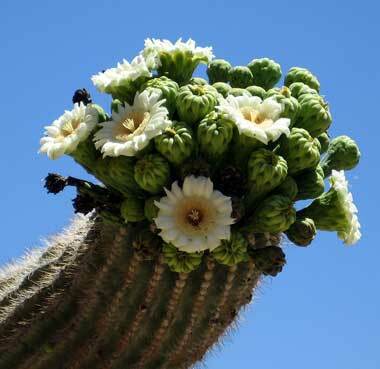 They are also slow at propagating, and the giant saguaro cactus is a candidate for the endangered species list. Harming a saguaro cactus in any manner is illegal in Arizona, and during construction projects, special precautions must be taken to move every saguaro affected. Mature five armed Saguaro cactus in bloom in late May; photo by Leonard G. / Wikipedia; Creative Commons ShareAlike 1.0 license.